What began twenty five years ago as a philosophical state of mind is now a state-of-the-art winemaking facility where the ancient art of winemaking is pursued with a singular passion. Etude Wines is dedicated to mastering the craft of winegrowing. In classical music, an etude is a composition with a technical focus that allows the musician to practice a particular technique. Similarly, Etude wines are the product of deliberate concentration on the instructive variables of the craft. The end game is not edification alone, but rather the wine itself as a source of enjoyment. Chopin piano etudes are notoriously difficult but sublimely beautiful... this is an example of the practicing craft transformed to art. Founder and self described winegrower Tony Soter puts it this way: "There's no better vehicle with which to study or practice the craft of winemaking than Pinot Noir. It is the most challenging, unforgiving and quixotic of all wine grapes, and yet the most delicate and transparent." "Make no mistake it is a humbling pursuit, but when it's right, Pinot Noir is a glorious and moving thing. It is in the pursuit of that experience that we all work." Working together in this oenological quest for perfection are current winemaker Jon Priest and viticulturalist Franci Ashton. They transform the very finest Carneros and Napa Valley grapes into world-class wines sought out by the most discriminating wine lovers. 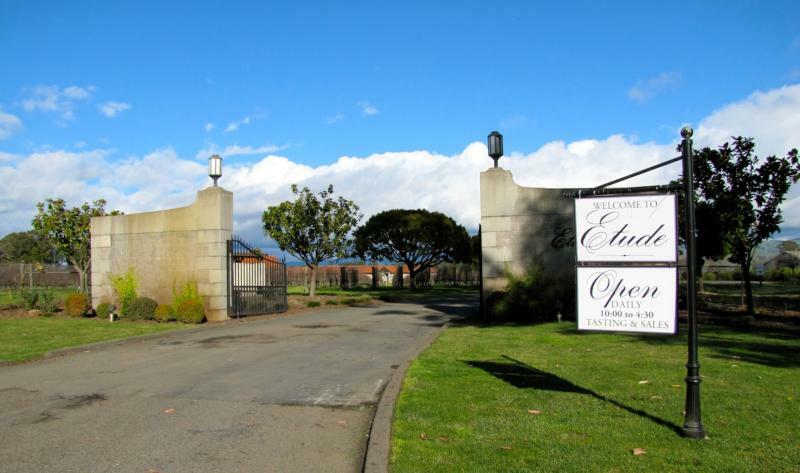 In addition to its widely acclaimed Carneros Pinot Noir and legendary Napa Valley Cabernet Sauvignon, Etude has also developed a loyal following for Pinot Gris, Pinot Blanc and Merlot.
" Just as a song's lyrics give meaning to its melody, the vineyard gives unique character to a wine. Etude has handcrafted its celebrated Pinot Noir from the Carneros region for over 30 years and is now taking its steadfast study of the varietal to the famed Santa Barbara Country appellation. Moderately light reddish-purple color in the glass. Nice black cherry core, flavorful and this wine has a more noticeable cut of citrusy acid on the finish. Nicely spiced with subtle oak notes in the background and a fresh cherry ending. At this stage, the flavors trump the nose. Wine Spectator 93"Loamy earth, currant and blackberry aromas have a dusty edge. Intense yet elegant, full-bodied and concentrated, with firm tannins providing structure and depth. Best from 2010 through 2016. 296 cases made." Robert Parker 94"The classic, deep ruby/purple-tinged 2004 Cabernet Sauvignon Napa offers aromas of tobacco leaf, cedar, black currants, tar, licorice, and espresso. Full-bodied, powerful, and opulent, it can be drunk now or cellared for 15 or more years." Wine Enthusiast 95 Robert Parker "Etude has fashioned a dense ruby-colored 2002 Merlot. It offers rich aromas of mocha-infused black cherries intermixed with coffee and herbal undertones. Sweet fruit, medium body, and a soft texture result in a complex Merlot to drink over the next 7-8 years." Wine Spectator 92"Supple and harmonious, with richness joined by a classy elegance, offering a range of understated currant, black cherry and plummy Cabernet fruit. The tannins are soft and fleshy, with a nice push of fruit complexity on the finish. Drink now through 2012. 285 cases made. –JL"
Robert Parker 92"A gorgeous wine with a deep ruby/purple color and a big, sweet nose of tobacco leaf, coffee, black currants, and licorice. The oak is nicely integrated in this full-bodied, ripe, exuberant Cabernet. It should drink well young and age nicely for 12-15 years." Robert Parker 91"The 2003 Cabernet Sauvignon is even more forward than the 2004, with a plump, heady, corpulent mouthfeel and loads of cassis, licorice, and pain grille notes and a hint of graphite. Deep, full-bodied, chewy, and supple-textured, this wine should drink well for 14 or so years."